So I’m sitting in the waiting room at my normal mid-week osteopath appointment with Daniel. It’s mid afternoon and the sun hasn’t bothered to make an appearance and is already on its way to the other side of the world. This is what the next few months have in store. But man, have I had a few experiences to remember over the last few months? The cold and dark will have to work hard to take any of the shine off those memories. 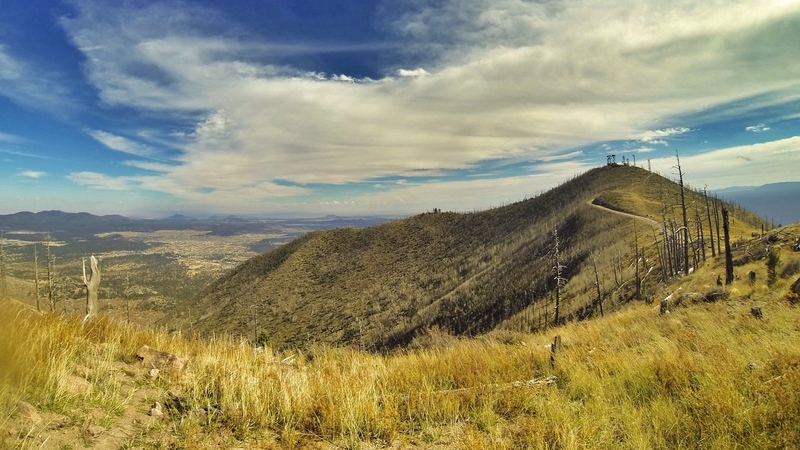 My time in Flagstaff was incredible. Yeah, the training was good, the trails were fantastic but it was the handful of brilliant people I met that made it so rewarding. Those people have given more than they realise, and just when I needed it. Life changes are blowing around me and I needed a little confirmation that ‘hopes’ could be achieved. It’s given me a renewed drive (not that it was ever lacking) and I know for sure what I want. I’ll always be grateful for that. And there will always be a part me longing to return. 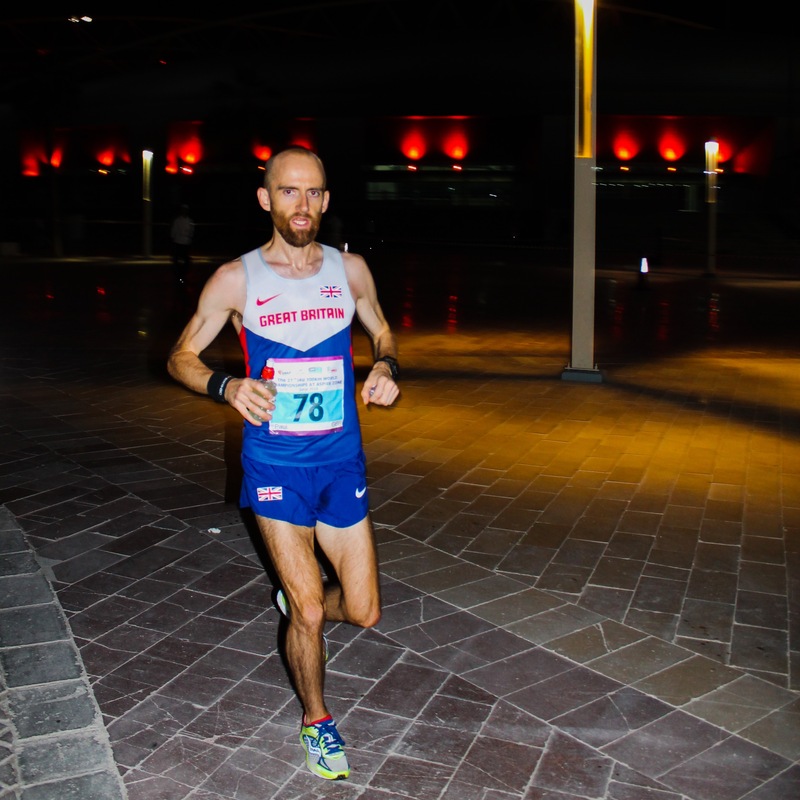 So, coming back from Arizona, I had a few weeks until I’d meet up with the GB team in Doha for the IAU 100K World Championships. It took me a few days to get over the shock of returning to Scotland in winter and to deal with a little tiredness from training and travel. I had some more training to do however and wanted to ensure I was ready for the heat and humidity of Qatar. Following an email conversation with Dr Stacy Sims (Osmo founder), I had a plan to supplement normal training with some sauna sessions. Pretty unpleasant overall but worth the effort. I also spoke with the team at Napier University’s Centre for Human Performance Innovation and Research and arranged a few sessions in the heat chamber the week before I left, just to see what it felt like before the race. I’ve been really lucky to have access to great facilities and the best sport science brains in Scotland – thanks Geraint. Fast forward to the evening of Monday the 17th November, I was heading for Glasgow Airport in the rain to meet up with the Scottish based team to travel overnight to the middle-east. I met Jo Zakrzewski for the first time and over the course of the journey she kindly gave us a full run-down of what to expect having raced out there at the World 50K champs weeks before. We would stay (and race) in the Aspire Zone – a pretty new sports ‘town?’ made up of hotels, shopping mall, pitches and stadia. A little strange to be honest and as impressive as the buildings were, it all felt a little soul-less. The rest of the team arrived from London later that night. Was great to meet some of the guys who’s successes I’d followed over the last few years. Esteemed company indeed (and I’m pleased to report, pretty decent people too!). The days before the race were hard going. I was in a new place. I wanted to see some of it but I needed to rest up as much as I could and get everything prepared for the race. The race start was a little crazy. All jostling and elbows, with the entire field all wanting to start from the very front. Can only assume that some just wanted to make the start photos as a few didn’t look like they’d be making the leaderboard even at the end of lap 1. 6pm, countdown from 10 seconds and we were off – 20 x laps of a 5K loop. I settled in and was relieved to finally get going. The pre-race stresses all lifted by the first corner. It’s a good feeling – race time. Whilst the heat wasn’t overbearing, within a few kilometres I could feel the sweat running down my back. I spent the next few laps, carefully watching my pace, happy to see a bunch of about 20 runners open up a gap in front. The course wasn’t fantastic. There were cobbled sections, marble tiles and at least three 180 degree turns. The official feed-zone was poorly lit and one of the water stations was positioned just before a marble section where most runners poured water over themselves. I just kept my head down for the first 50K, and tried not to take too much notice of the lap numbers. My pace was pretty much on plan and after a spell running with one of the US athletes I was pretty much running on my own after passing a few that set out too quickly. With about 200+ runners however, you’re never really on your own as there are races within the race and everyone running with their own pace strategies. The turns and dog-legs of the course allowed you to see what was going on ahead and behind along much of the route. It was great to see the rest of the GB team throughout. The GB girls absolutely dominated which was brilliant to watch from inside the race. I rigidly stuck to my plan, from pace, to hydration and food. But as the race entered the final quarter it became even more difficult to know what was going on in terms of position. Our support crew were tied to the feed-zone where there were no live details or leaderboards, so couldn’t do too much to help with updated information. I knew I was in top 12 and unexpectedly was leading the team. A couple of the guys had a tough day and on other occasions could have been pushing the lead pack. Next time! I tried my hardest to stay focused throughout and I was very aware when my pace started to drop. I fought hard to maintain target pace but my legs were starting to feel as bad as the people stumbling out the over-flowing portaloos. I can’t remember seeing so many people vomiting in any race in the past. Almost made me chuckle at times. We’ve all been there. Fortunately my stomach felt good throughout and I didn’t have to endure the toilets. The osmo and honeystinger combo keeping things settled. The last few laps, I was gritting my teeth and talking to my legs. “Come on legs, you cruised this pace only an hour ago.” I begged them to move properly like they had done for the last 6+ hours. The hard surface, the humidity and the pace had started to bite though. I longed for some climbs or loose trail. My feet were really burning by this point. I needed to get it finished, and soon. Coming on to the last lap I could feel that I was being caught. The running superstar Steve Way was closing in. I swore a bit. I pushed and I pushed. At the final pass of the feed-zone there was some relief. I could see behind, and I knew no-one else would pass me. When I turned onto the final straight I wasn’t sure of my final position but I knew I was comfortably under 7 hours, and was the first of the team to finish. I don’t think anyone held high expectations of me. Before the race I had been reminded that I was the slowest in the team. Roads aren’t my natural habitat but I knew I could go sub-7 before I started and I know now that I can go quicker again. Steve, Craig and Paul all came in soon after. We’d be very close to getting a team medal. The US guys had convincingly taken Gold and it would be between us, the Japanese and Swedish teams to share the rest. Ellie Greenwood lead in the winning girls team and took individual Gold (World Champ!!!). Incredible performance by them all and thoroughly deserved. They absolutely smashed it. I sat in an ice-bath immediately after finishing. I didn’t bother taking my shoes off, I just wanted to sit down and stop moving. The others were still running so there was no-one around I recognised. I felt pretty lonely, and just wanted a “well-done” hug from someone who cared. Steve and his wife soon appeared and offered me a drink as he tried unsuccessfully to climb into the icy paddling pool and sit. After a few more minutes I climbed out and walked back along to the feed-zone to pick up my bag. I thanked them all for the great support, sat for a few minutes then started to walk back to the start / finish area. I had maybe sat in the ice-bath too long or it was too much of a shock to my body but I started to shiver uncontrollably and I felt incredibly ill / out-of-it. I lay on a floor for an hour or so and was given some towels to try and warm up. It was a very unpleasant time and looking back I should have at least changed out of my wet clothes. I hadn’t been thinking clearly though. Eventually I was rescued with a couple of cups of hot soup and the minute I’d drunk the first I was completely alert again. Back at the Hotel, Craig and I tried to sleep after baths and demolishing any palatable snacks we could find. Sleep wasn’t going to happen though and we counted down the time to breakfast opening at 06.30 by talking about how much we were going to eat and at what side of the buffet we’d start ‘round 1’. We were outside, ready to eat at 06:29. I don’t think we left until after 08:15. We finally got word from home that we’d won a bronze. Happy days! We followed up breakfast with a swim in the outdoor pool on the 19th floor, and then had to pack up our stuff and clear the room. There would be no sleep now until the airport and the Scottish section weren’t getting picked up until after midnight. It wasn’t the most comfortable journey I’ve ever had, but it was more than worth it. Getting the chance to be part of a fantastic GB team, race some of the best ultra-runners in the world and return with more than just a plastic finishers medal – it was an experience that will stay with me. Huge thanks to the rest of the team, the selectors and to Walter, Adrian, Eleanor and all the additional support we had around the course (and at home). I’d also like to thank Stacy at Osmo for her excellent advice, Geraint at Napier for the on-going support and Daniel who continues to treat me weekly. I’d also like to thank my sponsors: Nathan, Osmo, Feetures, HoneyStinger and Rocktape. 2015 is already looking like it’s going to be a big year – exciting times ahead! If you’re planning your races for 2015 and you want to ensure you’re in the best possible shape I’m offering distance training support. Check out my website for more details and drop me a note if you want to discuss.